Have you heard of Tier 4 Compliance but are not sure what it means for your business? If so, you are not alone. Tier 4 is a new environmental standard from the EPA (Environmental Protection Agency) which was phased in between 2008 and 2015 leaving a lot of people outside of the engine manufacturing industry confused. Tier 4 rules set a new standard for what is considered an acceptable level of emissions production for “non-road diesel engines”. It has resulted in a significant shift in the way companies produce engines for industrial and agricultural equipment. The EPA originally implemented the Tier 4 system in order to create a standard by which to regulate the emissions for “non-road diesel engines”. 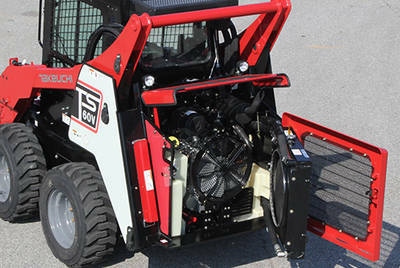 These include industrial equipment like skid steer loaders, excavators and even stationary equipment like generators. The Tier 4 standard, phased in by 2015, introduces a substantial reduction in NOx emissions above and beyond what was introduced during the Tier 1-3 initiative. They accomplished this by using their regulatory body to force engine manufacturers to invest in new technological solutions to decrease engine emissions. The good news is that if you own a machine built before these standards went into effect you don’t have to worry about Tier 4 Compliance. Replacement parts for existing engines are generally not required to meet Tier 4 regulations. However, if you need to replace your engines, vendors can only supply you with a Tier 4 compliant engine. 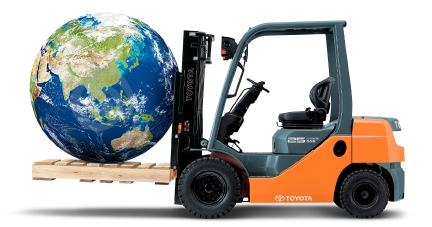 If you are in the market some new equipment like a new forklift or a track loader, you can expect to see a small increase (1-3%) in price and you’ll be required to use Ultra-Low Sulfur Fuel costing about 7 cents more per gallon. The use of high sulfur fuel will not only violate Tier 4 regulations, but can cause operational problems and jeopardize the component life of your new engine. Tier 4 compliant machines will function in nearly the same way as Tier 3 compliant machines. However, operators will notice a few new switches and dash lights relating to the engine’s Regeneration Process. The Regeneration Process heats up the engine and burns out excess carbon. 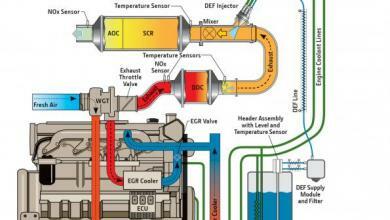 This process is essential for the engine to run smoothly. Failure to perform the Regeneration Process will significantly lower the RPM of the vehicle and eventually cause it to stall out. Dash indicators will alert operators when a Regeneration is necessary and the process typically takes only 20-40 minutes to complete. It is recommended that operators familiarize themselves with these new systems and take care to only use Ultra-Low Sulfur Fuel when refueling. A compliant fleet lets customers know that you are in compliance with the recent regulatory changes and are offering the most cutting-edge equipment to their job site. Machines equipped with Tier 4 compliant engines will also deliver up to 5% better fuel economy than Tier 3 compliant engines and maintenance costs will be lower due to the increased engine efficiency. Once all applicable vehicles are equipped with Tier 4 compliant engines, 739,000 tons of NOx and 129,000 tons of PM will be eliminated from our environment annually. This would be similar to the environmental impact of removing over 25 million passenger cars from American roads. It is estimated that by 2030, these standards will prevent 12,000 premature deaths every year. 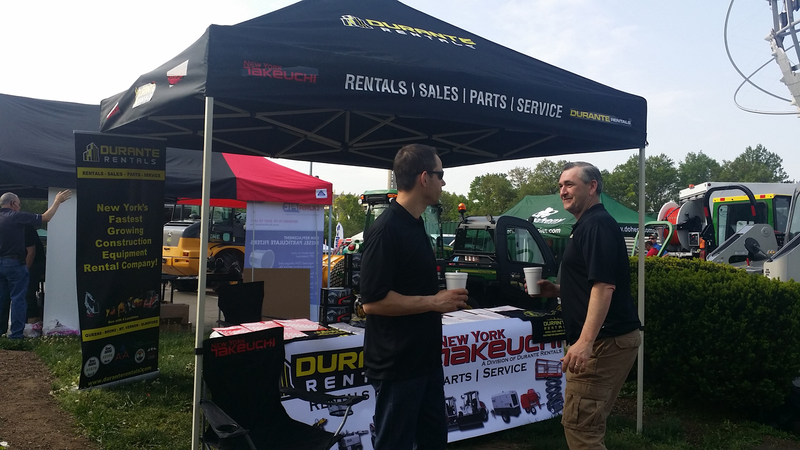 Durante Rentals and New York Takeuchi, a division of Durante Rentals, will be showcasing their latest Takeuchi earth-moving machines at the 28th NYC Parks Vehicle andEquipment Show. The event will take place on May 12th, from 9am to 2pm, in Flushing Meadows Corona Park, by the iconic Unisphere. The free event will once again be hosted by the NYCDepartment of Citywide Administrative Services and will feature food, entertainment, games and excitement along with an exclusive look at the latest in light and heavy-duty vehicles, trucks, horticultural equipment, tools, fleet sustainability related services and more. 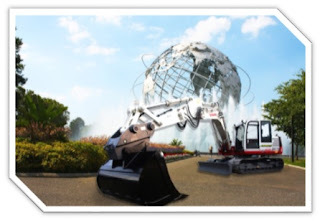 Durante Rentals will be displaying their Takeuchi mini excavators, skid steer and track loaders around the circumference of the Unisphere. Attendees are encouraged to take an up-close look at these powerful, rugged and reliable machines and to take advantage of special show pricing. The event will feature a special focus on high tech safety devices including cameras and fleet management technology aimed at reducing collisions and other causes of workplace injuries. There will also be a continuing emphasis on green technologies like alternative fuels and emissions reduction systems. This year, the show will once again feature several vendors supporting NYC’s Vision Zero safety initiative as well as the brand new Clean Fleet initiative which aims to cut NYC’s municipal vehicle emissions in half by 2025. Founded in 2009 by three entrepreneurs, Durante Rentals is the most trusted name in construction equipment rentals in New York with locations in Elmsford, Carmel, West Nyack, Mt. Vernon, Queens and the Bronx. With the core values of Speed, Convenience and Culture, customers look to Durante for all their construction equipment needs including telehandlers, scissor lifts, generators, boom lifts, conveyors, track loaders, skid steers, ride-on rollers, forklifts and more. Durante Rentals services all five boroughs of NYC, Westchester, Rockland County, Putnam County, Connecticut and New Jersey. For more information about Durante Rentals, visit www.DuranteRentals.com. New York Takeuchi is an authorized dealer for the New York City, Westchester, Putnam County and Rockland County area. They specialize in sales, rentals, service and parts for the full Takeuchi fleet of machines including track loaders, wheel loaders, skid steers, and mini excavators. NY Takeuchi also features all of the latest Takeuchi models like the TL12V2 Compact Track Loader. New York Takeuchi is a division of Durante Rentals. For more information, visit www.nytakeuchi.com. What is the Difference Between Cement / Concrete Mixers and a Mortar Mixers? 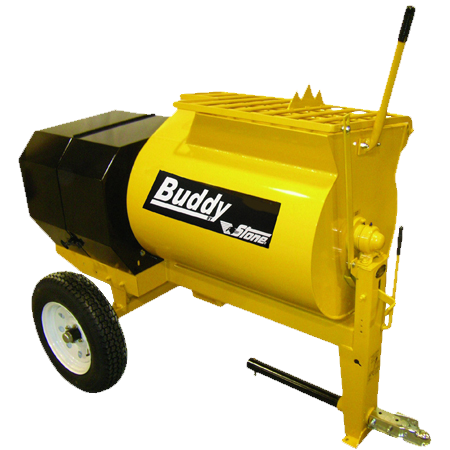 What is the Difference Between Cement / Concrete Mixers and Mortar Mixers? 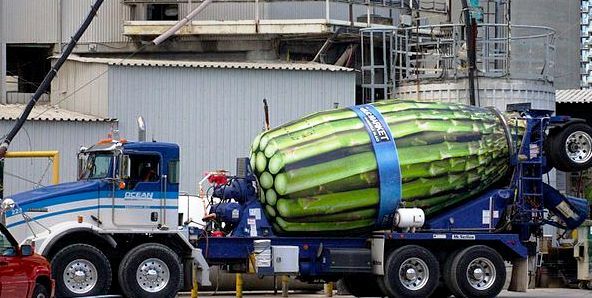 Contractors know the importance of using the right tools for the job. While mortar and cement / concrete may have similar ingredients, using the wrong type of mixer can be disastrous for both your job and equipment. The main difference between cement and mortar is consistency. Cement generally incorporates gravel or rock chips and has a thinner consistency when mixed. It is much stronger than mortar and is ideal for structural projects like foundations, support beams and walls. Cement structures are often reinforced with steel rebar in order to ensure that they keep their integrity even while they settle in the soil. While the term “cement” is often used as another term for “concrete”, cement is actually a key ingredient in concrete, along with sand, gravel and pieces of stone. Mortar has many of the same ingredients as concrete including sand and gravel. However, mortar has a higher water content, giving it a thicker consistency. It works well as a “glue” for bonding materials like brickwork or stone together. 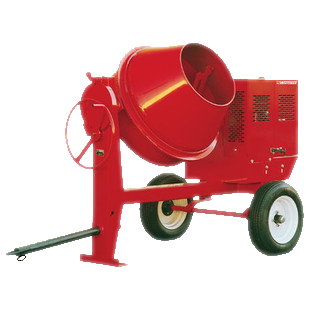 Mortar mixers are made up of a stationary barrel and an internal paddle with a rubber strip. The paddle rotates and simultaneously mixes the mortar while scraping the sides of the barrel keeping the adhesive mortar from sticking to its sides. These heavy duty mixers are tough enough to handle a range of jobs including stucco, plaster, epoxy, terrazzo, drywall mud, paint or grout. While they work well for mortar mixtures, they should NEVER be used for cement / concrete mixtures. A much courser mixture like concrete causes wear on the rubber strips and pieces of rock or gravel can clog the paddle. These horizontal mixers feature a rotating drum or barrel with no paddle. You may have seen horizontal mixers like these in action on the back of cement trucks on their way to a job site. The constant rotation of the barrel / drum ensure that the cement / concrete mixture combines smoothly and doesn’t settle until it’s ready to be poured. These types of mixers are ideal for mixes containing larger fragments like cement / concrete but are less effective for “smoother” mixtures like mortar. What is my company’s current financial situation? What make more sense financially for my company, buying or renting? A company that owns its equipment assumes all of the financial risks. The operating costs of ownership, including maintenance, repairs, inspections, transportation and storage will increase over the life of the equipment. Equipment Rental companies like Durante Rentals replace their core equipment every five to six years. A company that owns their equipment will likely retain their equipment for as long as it is economically feasible, essentially running it until it breaks down. Rental companies generate an average of 800 hours annually on their core construction equipment, while contractors average around 1,500 hours. Higher hours of annual utilization result in increased maintenance costs and ultimately more downtime. Renting equipment can help companies reduce fixed and staff costs while minimizing the financial risks associated with owning a large equipment fleet. Growing companies with limited capital use rental equipment to protect their available working capital. Renting equipment allows them to take on an increased number of projects helping to drive revenue. Certain types of businesses like government, private, or non-profit organizations, may deduct rental costs as a business expense. How do I manage the service and maintenance of the equipment I own? If your operators have been properly trained to use the equipment, it usually won’t require constant repairs, just regular maintenance. However, a lack of training and experience can lead to costly repairs and dreaded downtime. When renting, most repair and maintenance services are included with your rental charges. 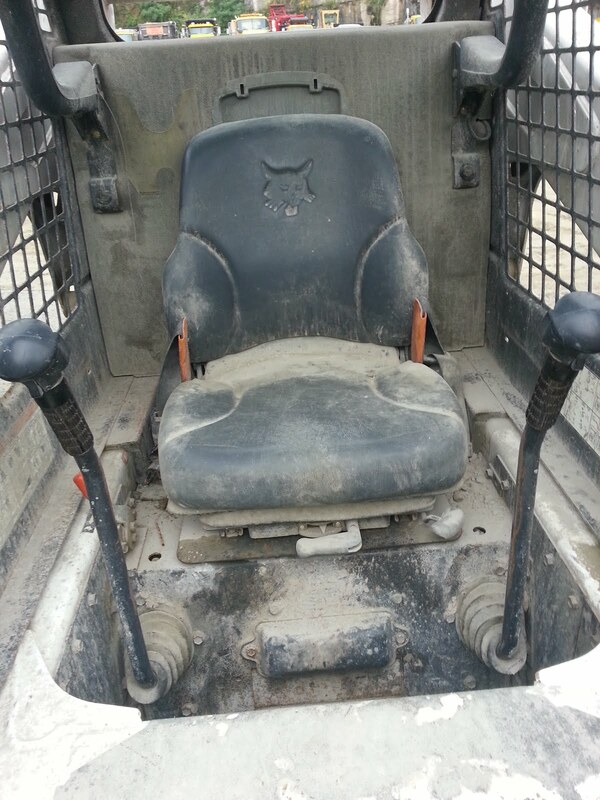 If the equipment breaks down, the rental a technician will be dispatched to repair it. If the equipment cannot be repaired on site, a “swap” may be provided to help avoid costly construction delays. Renting allows you the peace of mind to know the job will always move forward and never stall due to mechanical failures. How long do I need this and where will I to store it? Many companies balance their equipment fleet with rental equipment needed for specialized projects or for short durations. Renting is an excellent method for growing your business. If you only use it sporadically, rent it! Most rental houses allow flexibility so equipment can be rented for the day, week, month or longer depending on your needs. There is no long-term commitment to worry about. Purchasing hauling equipment is an additional expense for the equipment owner. Making matters worse, the trailer or vehicle being used for transport usually sits idle while the equipment is hard at work. While you can always hire a third-party hauler to move your equipment, this method can get quite costly, especially if your jobs are of short duration and your equipment needs to be moved frequently.... If renting, most companies will offset this cost with affordable drop off and pickup rates. A combination of renting and owning will help your construction company meet both its short and long term equipment needs. Determining the right mix requires careful evaluation of your needs and financial situation. Remember, the duration of your job will be a huge determining factor when deciding to rent or own. If the full cost of ownership and the utilization rates aren’t noticeably less expensive, then consider renting as your best option. You’ll be more than happy to re-invest these savings into other areas of your business that may need an influx of cash.